Honouring the best films and entertainment of the past year, the Jameson Empire Awards took place last night, hosted by David Walliams. 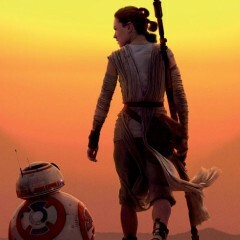 The force remained strong for Star Wars: The Force Awakens which received the most awards. Daisy Ridley was moved by a sombre and poignant speech Harrison Ford delivered on the last day of filming STAR WARS: THE FORCE AWAKENS. Star Wars: The Force Awakens shattered box office records upon its debut becoming the biggest film of all time in UK with a current box office total of over £122.66million plus a total of $2.05 billion worldwide. Star Wars: The Force Awakens has become the UK and Ireland’s biggest ever cinematic release. The film, which has only been on release for 22 days, has today overtaken Skyfall’s £103.2million in the UK and earlier this week became the second in history to reach £100million in the UK. Full Friday results to be confirmed.